BIOGIT®, the gastrointestinal (GI) friendly probiotic yeast, is India’s first indigenously developed non-pathogenic Probiotic Yeast with a global patent. 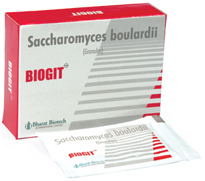 BIOGIT®, prepared from live yeast cells, restores the disrupted gastrointestinal microbial balance and is an ideal probiotic for all age groups. It is able to improve lactase deficiency following rotavirus diarrhoea and is efficacious in treating infantile diarrhoea, HIV-and antibiotics-associated diarrhoea, travellers’ diarrhoea and diarrhoea caused by the Crohn’s disease. Bharat Biotech is the first company to introduce a probiotic in a capsule formulation.We are the largest exporters for BIOGIT® to more than 40 countries.